As we walked around Disneyland all morning, I really began to look forward to our lunch at the Blue Bayou. When lunch time rolled around, I was not disappointed! The highlight of our dining experience was the ambiance of the restaurant. When you walk in, you truly feel that you are being seated beside a real bayou. Even at noon when it is bright and sunny outside, it feels like evening inside. The sounds of crickets and softly flowing water serenade you as you eat. The bayou setting is part of the Pirates of the Caribbean ride, so you will see the boats passing through during your meal. We were seated right beside the water and I sat facing the bayou so that I could watch the boats go by. I was a bit disappointed at first because the ride was closed temporarily, so there was no action on the water. Fortunately, it didn’t remain closed for long and soon the boats were up and running again. I enjoyed watching the guests pass and wave and I was excited at the thought taking a boat ride myself after lunch. Our server came to our table and started us off with drinks. They have the usual soda choices, but also have a couple of signature drinks. We had heard that the mint julep was a nice treat and ordered one of those. We also ordered a Louisiana lemonade. I chose to order my drink with a souvenir glow cube because, well, why not? 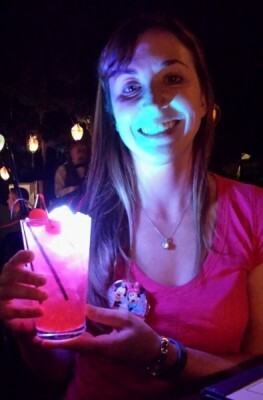 It is so much fun to have a drink that lights up! Both drinks are non-alcoholic so they are available to everyone. The lemonade was sweet and tart, as you would expect. The mint julep was very refreshing, especially on a hot day. For my meal, I ordered the Tesoro Island Chicken Breast. This dish is served with Boursin cheese mashed potatoes, sautéed spinach, and fennel confit with roasted shallot reduction. 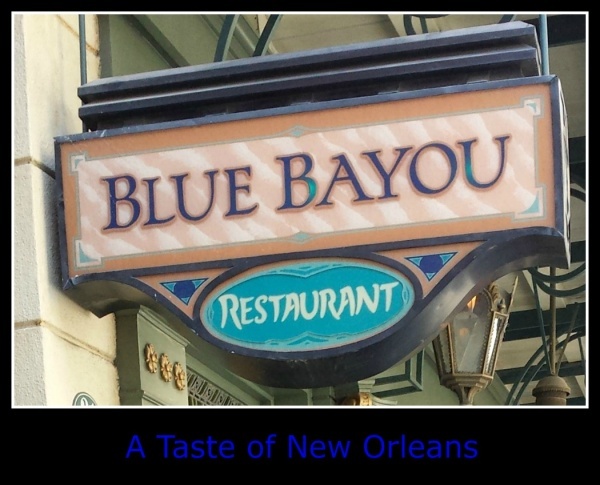 You also have a choice of a Blue Bayou house salad or cup of New Orleans gumbo as a starter. As much as I wanted to try the gumbo, I was afraid it would be too filling and opted for the salad. It was good and didn’t fill me up so much that I didn’t enjoy my entree. As far as the entree goes, the chicken was very tender and seasoned well. The spinach was creamy and had a great flavor. The mashed potatoes were my favorite part of the dish. The Boursin cheese gave them a delicious flavor and they were creamy and whipped to perfection. I could have eaten just these as my meal and been happy! My husband chose the Portobello Mushroom and Couscous Macque Choux. This is a vegetarian dish, marinated in a balsamic vinaigrette, then broiled. It is accompanied by roasted corn and bell pepper-Israeli couscous, and sautéed spinach. I should note that my husband is not a huge fan of spinach, but he still ate every bite of this dish. Of course, I had to try a bite as well. I thought the portobello mushrooms and couscous were a great combination. There was a nice amount of balsamic and it wasn’t too saucy. While I enjoyed it, I personally preferred the chicken. I wish we had pictures of our entrees to share, but it was just too dark inside to take any. Even though we were stuffed, we couldn’t pass up dessert and opted to share a creme brulee. It was creamy with just the right amount of caramelized sugar on top. Creme brulee is one of my favorite desserts so I order it a lot. Many place overdo it when they caramelize the sugar, but this one was perfect. We ate every last bite! As we left the restaurant and walked out into the blinding sun, I immediately missed the relaxed feel of the restaurant. I wasn’t away from the bayou for very long though because we immediately jumped in line for Pirates of the Caribbean. My next glimpse of the bayou was from the other side and this time we were the ones waving as our boat passed by. Have you enjoyed the sights, sounds, and tastes of the Blue Bayou? What did you think?